Sustained Release Pellets: Non Pareil Seeds, Anti-Caking Agent: Purified Talc, Capsule Shell: Pharmaceutical Grade Gelatin [Halal Bovine Source], Ferrous Fumarate, Sucrose, Zinc Sulphate, Bulking Agent: Potato Starch, Vitamin B6 (as Pyridoxine HCl), Hydroxypropylmethylcellulose, Copper Sulphate, Vitamin B12 (Cyanocobalamin [Carrier: Dicalcium Phosphate]) & Folic Acid (as Pteroylmonoglutamic Acid). 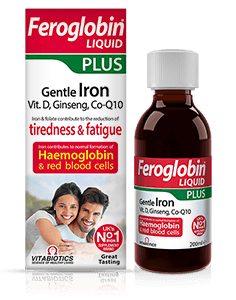 Feroglobin Capsules have been formulated with a slow release action which is designed to be gentle on the stomach. This product contains iron, which if taken in excess, may be harmful to very young children. Why have Feroglobin Capsules been developed? When are Feroglobin Capsules recommended? What do I need to know before starting to use Feroglobin? Can Feroglobin be used simultaneously with medications? How and when should Feroglobin Capsules be used? 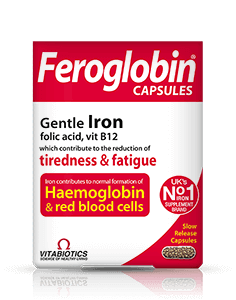 Feroglobin Capsules have been developed to provide an effective source of essential nutrients including folic acid, vitamins B6 & B12 and iron which contribute to the reduction of tiredness and fatigue. This unique combination is suitable during pregnancy and for women during the monthly cycle. 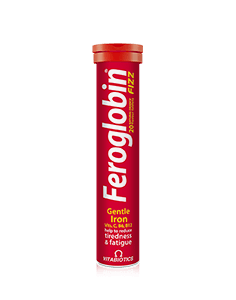 Athletes and slimmers may also benefit from the nutrients found in Feroglobin Capsules. Feroglobin Capsules are suitable for people of all ages and is particularly suitable for: during pregnancy, menstruating women, athletes and slimmer's. Feroglobin capsules are formulated for long-term use and can be taken for as long as required. There is no maximum length of time over which it may be used. 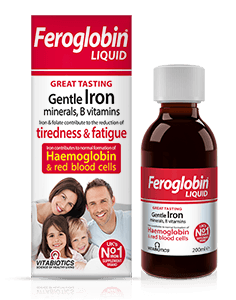 Feroglobin is available in both capsule and liquid form. Feroglobin Capsules are suitable for men and women, and have been developed with a special slow release system. This helps prevent excess iron in the stomach, and ensures that the release of blood forming nutrients is gradual and even. Generally, Feroglobin can be taken alongside medications because it contains only moderate levels of vitamins and minerals. For specific advice on taking Feroglobin with medicines, we recommend that you contact your doctor or pharmacist first. Feroglobin Capsules - One capsule daily is recommended with or immediately after your main meal, with water or a cold drink. Always ensure that Feroglobin Capsules are taken with plenty of liquid to help wash the capsule down, and not tea or coffee as this may cause the capsule to disintegrate too early. Taking the capsule with a large meal maximises the absorption of the nutrients. Feroglobin Capsules should only be taken on a full stomach.